Momma Goose Amber Teething Necklaces are a natural form of pain relief for teething babies. Amber itself is a fossilized tree resin, and contains "succinic acid", which when released into the skin, provides anti-inflammatory and analgesic properties. For a teething baby, this means pain relief and reduction of the inflammation of the gums that accompanies teething! When the amber is worn against the skin, the warmth of the skin allows the amber to release trace amounts of the succinic acid, providing the analgesic and anti-inflammatory properties to the water. Momma Goose Amber Necklaces are safe for your baby to wear. Each each on the necklace is individually knotted on the string, ensuring that if your baby breaks the necklace that only one bead will be free. Also, the beads are made smaller than the size of a pea. The plastic clasp at the back of the necklace is free from all metals and allergens, and is also held together by knots - ensuring that if there was enough pressure put on the clasp that it would break open. *Amber Necklaces are not meant to be chewed on. Choose the appropriate size for your baby so that they can not get the necklace into his/her mouth. 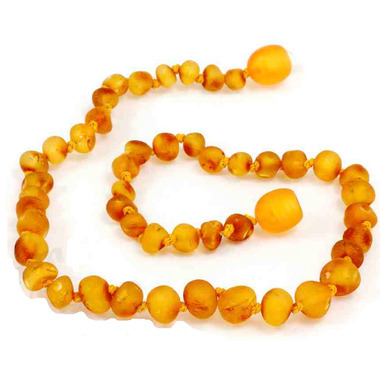 Amber necklaces are not meant to be worn to around the baby's neck while napping or going to bed. I bought the small one and It was too short .looks like a choker on his neck.my son is a tiny boy.buy the bigger size. Gave it a 4.5 starts out of 5 only because I recently purchased this and I haven't really seen any changes (nor has he really been wearing it a lot ... yet). However, it is a really cute necklace for my son! The material seems legitimate so I am hoping it will help my son. I have had amber necklaces for all my babies. I really like this one though. It has a different clasp. My other ones screwed together. This one pops in and out, so I know if it were to get caught on something, it would just pop open, rather than strangle my child! I bought one for my baby when she was 5 months old. I was a little skeptical at first when I opened the package because I wasn't sure what the amber should look like. My daughter seems to fuss less when she has it on and it looks super cute. The beads are knotted individually and are small to prevent choking so it definitely seems like a safe choice. Love this necklace! We find a definite change in our son's temperament while teething when he's wearing it. The beads are tiny (to prevent choking) and knotted in between so only one would come off if baby somehow broke it. It's cute too!